BHS students collaborate during Lena Pierce’s “Birthday Book Project”, a real world authentic project New Tech leaders encourage. 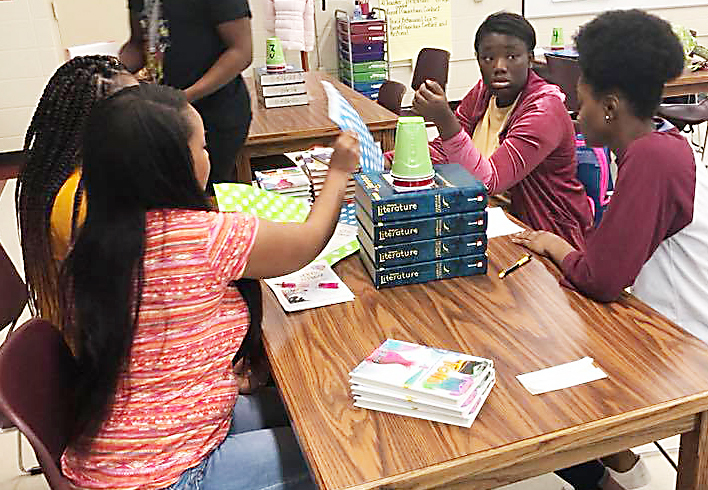 Blytheville High School’s New Tech Network is beginning its sixth year, and Matthew Swenson said that as eager as he is to help BHS instructors continue to push their instruction towards student-centered practice, he is equally interested in continuing the great things that are already happening at the high school. Swenson noted that refinement practice has to start with adult collaboration, and that adult culture leads to student culture. At BHS students need to know how to work well with others, in small teams and in larger groups, similar to the work required of our teachers. Through collaboration New Tech schools have defined student outcomes that are aimed at fully preparing them for college and career success. Swenson brought out that the students will be focusing heavily on Agency, or having ownership over one’s learning, this year. “We know that employers are looking for people who can self-manage and push innovative practice, and we want to ensure our students leave with this skill,” said Swenson. School leaders will also focus heavily this year on supporting teachers in project ideation, design and implementation, as project-based learning is the primary method of instruction at the high school. Project-based learning is an instructional method in which students work on a project over an extended period of time that engages them in solving a real-world problem or answering a complex question. Students will often demonstrate their knowledge and skills by developing a public product or presentation for a real audience. “Project-based learning is a great way to learn,” he stressed. “At BHS New Tech, what we always need is to teach students how to think through complex problems. That is the work of the future”. Sneed and Swenson both said they expect great things from students this year. They noted that high school students tend to be underestimated as to how effective they can be. “So what better way to get students ready for the world than to engage them in views on how the real world operates,” added Swenson.